I'm still baffled by the Emperor. Is he a Clone like in the old EU? A Sith Force Ghost which are/were considered incredibly rare? A Holocron containing part of Palpatine or his instructions to a powerful dark side ability? Time traveling Palpatine from the last season of Star Wars Rebels? Did Disney retcon his death in Return of the Jedi? - The whole setup seems weird and disjointed from the events the Return of the Jedi. - There are plotholes and straight-up logical errors to the degree where to me, suspension of disbelief is no longer possible and the plot falls completely apart. This is because things in the new trilogy don't make sense within the context of the SW universe itself. I agree with all of this. i think rain johnson really screwed the pooch, and Kathleen Kennedy has no idea what she is doing. It's really just a horrible franchise. It was fun back in 1977, but so was KISS. Rey really is the worst. We're two movies in and we still have NO idea what kind of person she actually is. That's true for all the other characters too but in the case of the main character, it's unforgivable. I'm looking forward to this movie. I tend to disagree with those who say TLJ was horrible. It was not. TFA was much better, but TLJ was not as horrible as the fanboi's will have you believe. Those who are questioning Rey's force knowledge and asking how she knows so much with so little training seem to forget that Luke didn't have all that much training, either. You don't get a sense, at least to me, how long Luke was on Dagobah. He arrives, he does some training, he goes off to Bespin. How long was that? A week? Months? Years? (Not likely, given the story line.) When we see Luke and Yoda again in Return of the Jedi it is implied this is Luke returning to finish his training. Yoda tells him he knows what he needs but Vader is his final test. Rose did nothing to add to the story. She's not Jar Jar, but I'd have been fine without her. Rey's character development is a touch befuddling. I don't really need to know her back story, though. Daisy Ridley has done a good job with what she's been handed. The Emperor aspect is what has my anticipatory juices flowing. Remember, Yoda said in the prequels: "Always 2, there are: A master, and an apprentice." Sith Lords don't do force ghosts (Tho Anakin's appearance as one at the end of Jedi could throw that one aside.) Darth Maul returned after being cut in half. Why couldn't the Emperor survive the fall down the reactor shaft and the subsequent explosion of the Death Star? What's to say that the Emperor hasn't been pulling strings all along with Kylo Ren: "Strike me down and your journey towards the dark side will be complete" he says to Luke. So, and I'm strictly speculating here, maybe Kylo had to kill Snoke to complete his own dark journey and did so at the behest of the Emperor. I agree that Luke and Han should have reunited at some point, tho I get why they didn't. I am sad that Carrie Fisher passed before these movies could be finished as I feel it would have helped this upcoming movie. The teaser trailer has my attention. It doesn't give you any aspect of a plot line, short of a destroyed death star. Are they on Yavin IV? Endor? It's not Jakku. I can't wait to see how they work Lando into this. All in all, I'm willing to give this movie a chance, and hope they hit a 6 run home run with it. The Last Jedi falls in a weird place for me. If you look at the movie in its totality, it falls somewhere in between mediocre-good. The first half of the movie I disliked, but the 2nd part really redeemed itself. We all know TLJ was supposed to have a different tone compared to The Force Awakens but no one predicted this much of a deviation. Apparently J.J. Abrams wrote out some notes for the storyline to better flow so Rian Johnson would have an easier time with continuity and overall flow. But Rian Johnson chose not to abide by those instructions and decided to not make a Star Wars Movie, but instead make a Rian Johnson Star Wars Movie. Given the TLJ's lackluster response among fans, I think J.J. Abrams pulled everything he could to redeem the Saga and end the official storyline on a good note. He realizes he has one shot at this and if it fails, the memory of the Star Wars we all grew up with will be forever tarnished and Disney will be blamed with teasing us with 2 great Star Wars movies, before wrecking the franchise with multiple lackluster/bad movies. So I expect The Rise of Skywalker will be quite good and tie up some loose ends (I'm sure Disney will withhold some answers as they like keeping some secrets to be found in their Comics, Books, TV Shows which is a smart marketing move). Sith Lords in general can't become Force ghosts due to their nature of obsessing over worldly power. Marka Ragnos from the old canon was a limited force ghost. Clone Wars is still considered Canon and Darth Bane's force ghost did make an appearance to Yoda, but Yoda referred to him as only an illusion. So the Sith can't exactly become Force Ghosts in the same sense a Jedi, but it is heavily alluded to that certain Sith can exist beyond death as a form of a 'Spirit'. 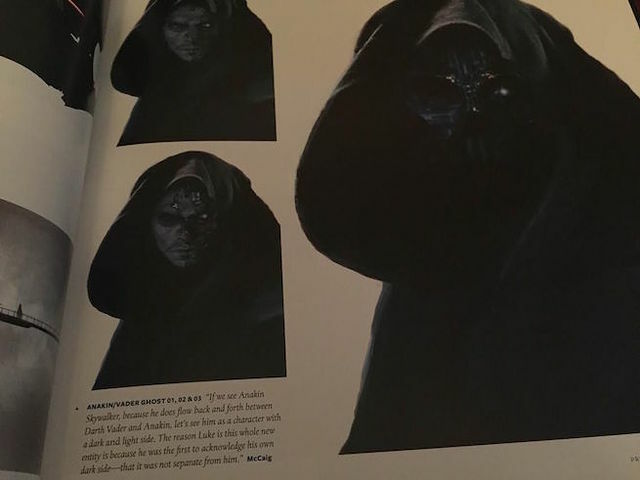 One interesting note is Anakin was originally set to make an appearance as a Force Ghost to Kylo Ren in The Force Awakens. But not as strictly Anakin or Vader, but a amalgamation of the two. Kylo asks Anakin "Show me again the power of the darkness, and I'll let nothing stand in our way. Show me, grandfather, and I will finish what you started". Some have speculated Anakin tried to tell Kylo the Dark Side is not the answer, but Kylo dismisses him thinking you aren't the version of Anakin I am talking to. Sith Lords in general can't become Force ghosts due to their nature of obsessing over worldly power. Marka Ragnos from the old canon was a limited force ghost. i disagree simply because star wars cannon/lore/mythos has now become "whatever Disney wants it to be"
so if they want a dark side force ghost we are probably going to get one..
That is true. Disney literally can Retcon or explain away anything now.